…is an intimate retreat/ camp/ gathering… whoops I mean “Happening” that happens mostly annually! our next event is in 2017. The teacher – student ratio is approximately 1:5. The seed for Hoopy Happenings was planted at The Tasmanian Circus Festival in 2009, where being predominantly a hula hooper or hula hoopist, depending on which you prefer to use, I found that there just wasn’t enough hooping. So out of purely selfish motives Hoopy Happenings began to be more than just a thought. After going to Hoopcamp in 2009 it was set in stone that Hoopy Happenings had to happen! The inaugural event was at Govinda Valley Retreat in 2010. In 2011 we moved it to Heathcote Scout Camp, which sits right on the edge of the Heathcote National Park. This means watching amazing sunsets as you look out into the bush and sip on a pre-dinner drink. It also means maybe you might see wildlife like snakes! But we haven’t seen any to date. The delicious vegetarian food is still catered for by Govinda’s. Some people say they come for the food & the hooping is an added plus! HH is a community event which I, Jewelz, organize. During the lead up help in promoting the event is greatly appreciated and during the weekend everyone pitches in & helps out. Once everyone walks through those gates the chaos ceases and we all get to play! Jewelz of Jewelz A Hoopz will be your contact throughout the booking procedure & one of your hostesses whilst at the retreat. Lisa of Spin Me Out (my sister for real & sometimes we perform as the La La Sistarz) will be co-hostess during your stay and possibly helping out with any questions just prior to the event. 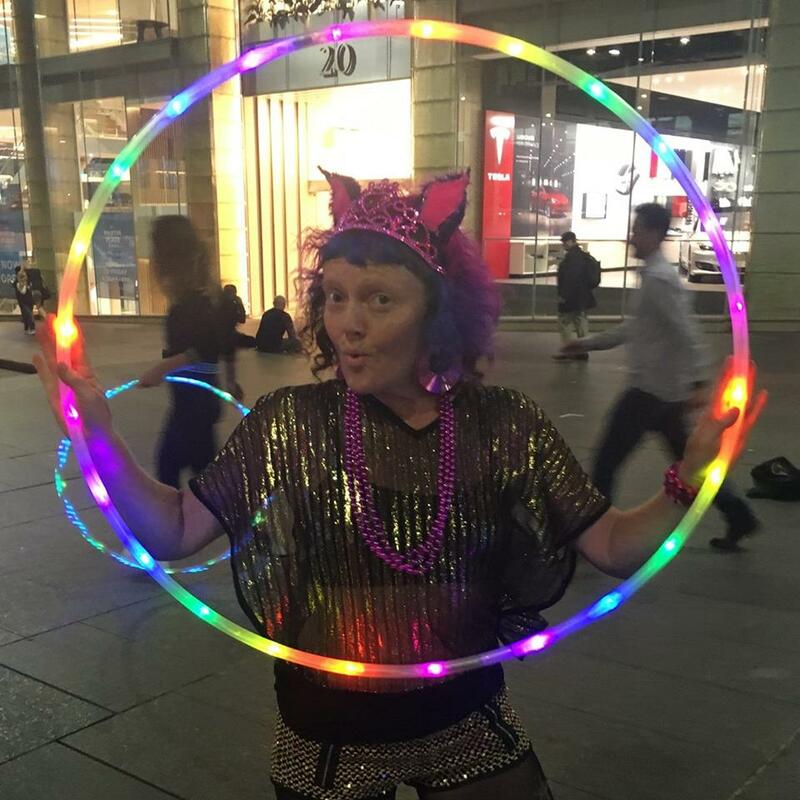 When choosing the Hoopy Happenings name I didn’t think of it’s meaning so much as how it sounded, and it stemmed from my tag “hoopy loopy happiness”. “Hoopy Camp”, “Hoopy Retreat”, and “Hoopy Gathering” just didn’t cut it. Hoopy Happening felt right and when I went looking for the meaning it confirmed my choice. Anything to do with hoops is hoopy! If you are mad about hooping then you are ‘hoopy”! adj. Neat, really together (about a person). One who really knows where his towel is. Originally from the radio series “The Hitchhikers Guide to the Galaxy” by Douglas Adams. Also see “frood”. Hoopy is at the bottom of the northern panhandle of WV, Wetzel County. Also used in the Pittsburgh area meaning south of the ‘Burgh, out in the country. Hey, are you goin’ down hoopy this weekend to do some 4-wheelin’? Crazy, weird, trippy, bizarre, strange, curious; cool, nifty, really great; unexpected- especially unexpectedly opportune. Man, directors from the 70’s really liked to make some hoopy stuff. In the late 1960s, perhaps due to the depiction in films of hippie culture, the term was used much less specifically to mean any gathering of interest, from a pool hall meet up or a jamming of a few young people to a beer blast or fancy formal party.